THERE is a thin line dividing free speech and hate speech. The problem is pointing out exactly where that line is. Free speech is the freedom to voice out our thoughts and expressions without restrictions, whilst hate speech is the abuse of this freedom to harm others, or speech intended to cause violence. Put differently, free speech means we can say whatever we want. Hate speech is when we say things that are offensive or harmful, targeted at a particular person or group of people. In the Malaysian context, “free speech” refers to “freedom of speech and expression” as stated in Article 10 of the Federal Constitution, which declares categorically in Clause (1) (a) that “every citizen has the right to freedom of speech and expression”. Free speech, which is available for Malaysian citizens only, is not absolute because that freedom is subject to several restrictions as set out in Clauses (2), (3) and (4) of the same Article. The position in other countries is not that far different. Last July, Minister in the Prime Minister’s Department Datuk Dr Mujahid Yusof Rawa proposed three new laws to criminalise hate speech — the Anti-Discrimination Act, National Harmony and Reconciliation Commission Act, and the Religious and Racial Hatred Act. Five months later, there are no new developments to the proposal. In September, Communications and Multimedia Minister Gobind Singh Deo stated there was a need to push ahead for laws on hate speech. He said such a law must have an “extra-territorial reach” to facilitate the prosecution of persons who reside abroad. Gobind was referring to a “turban remark” by a London-based blogger against a senior Bukit Aman officer, Datuk Seri Amar Singh, which he regarded as an attack against, not only the officer, but also the entire Sikh community. In late November, National Patriots Association (Patriot) president, Brigadier-General (Rtd) Datuk Mohamad Arshad Raji urged the police to monitor all hate speeches and messages pertaining to the ICERD (International Convention on the Elimination of All Forms of Racial Discrimination) rally on Dec 8. He was concerned about incendiary speeches and messages on social media might lead to chaos. 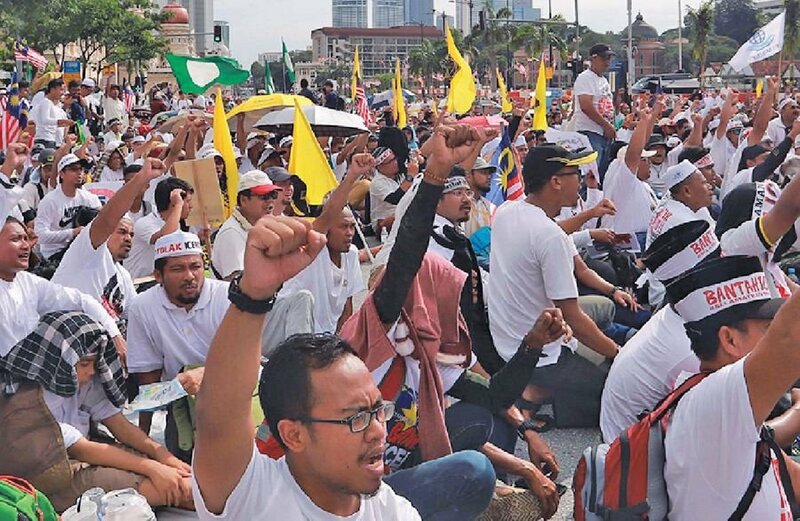 On Dec 26, police arrested Jaringan Melayu Malaysia (JMM) president Azwanddin Hamzah after he threatened to attack a police station during a rally in Klang, Selangor. Police also confirmed that Azwanddin would be investigated for making insults against Minister in Prime Minister’s department P. Waytha Moorthy and Primary Industries Minister Teresa Kok. Azwanddin had uttered a derogatory term on Waytha Moorthy, and accused Kok of being involved in the temple riot and had links to the developer. Gerakan Rakyat Malaysia (Geras), the rally organiser, later distanced itself from Azwanddin. Geras president Abu Bakar Mohamed said he disagreed with Azwanddin and was upset that he did not comply with the conditions to speak at the event. Ireland enacted its hate speech law 30 years ago, under the Prohibition of Incitement to Hatred Act 1989. Although enacted long ago, the first conviction was recorded only in 2000 when a bus driver was convicted for telling a Gambian passenger, “You should go back to where you came from”. Japan enacted its Hate Speech Act in May 2016 but it had no punitive provisions. The law was passed to comply with the United Nation’s ICERD Convention. At the international level, there are two UN Conventions containing provisions relating to hate speeches. One, the International Covenant on Civil and Political Rights (ICCPR) which states in Article 20(2) that, “Any advocacy of national, racial or religious hatred that constitutes incitement to discrimination, hostility or violence shall be prohibited by law”, and two, the Convention on the Elimination of All Forms of Racial Discrimination (ICERD), which states in Article 4(a) that, all states parties “shall declare an offence punishable by law all dissemination of ideas based on racial superiority or hatred, incitement to racial discrimination, as well as all acts of violence or incitement to such acts against any race or group of persons of another colour or ethnic origin”. Malaysia has never ratified ICCPR and has recently declared that it will not ratify ICERD. So, where does that leave us? To counter hate speeches, the police now invoke Section 504 of the Penal Code (intentional insult to provoke a breach of the peace) and Section 506 (criminal intimidation). For hate speeches via social media, Section 211 of Act 588 (dealing with offensive content), can be considered.